Monday is here yet again and here is your muffin fix for the week – Marble Streusel Muffins. I haven’t had good experience with marble cakes in the past, having only tried the store bought kind, but this homemade marble muffin was amazing. The recipe says to spoon equal parts of the vanilla and chocolate batters side by side, which I did but I think by adding each batter on top of each other rather than side by side you will get a muffin that has prettier layers when cut open. Now I have an excuse to bake up another batch to test out this layering method! The contrasting batters perform a lovely dance creating a tender muffin that is perfectly pleated with light and creamy folds of vanilla between deep rich chocolatey layers. Each bite is a heap of two perfectly sweet worlds together as one. The chocolate is bitter-sweet while the vanilla has a subtle cheesecake-like flavor from the smooth cream cheese incorporated into the dough. The muffins are covered with a buttery brown sugar streusel studded with toasted pecans. 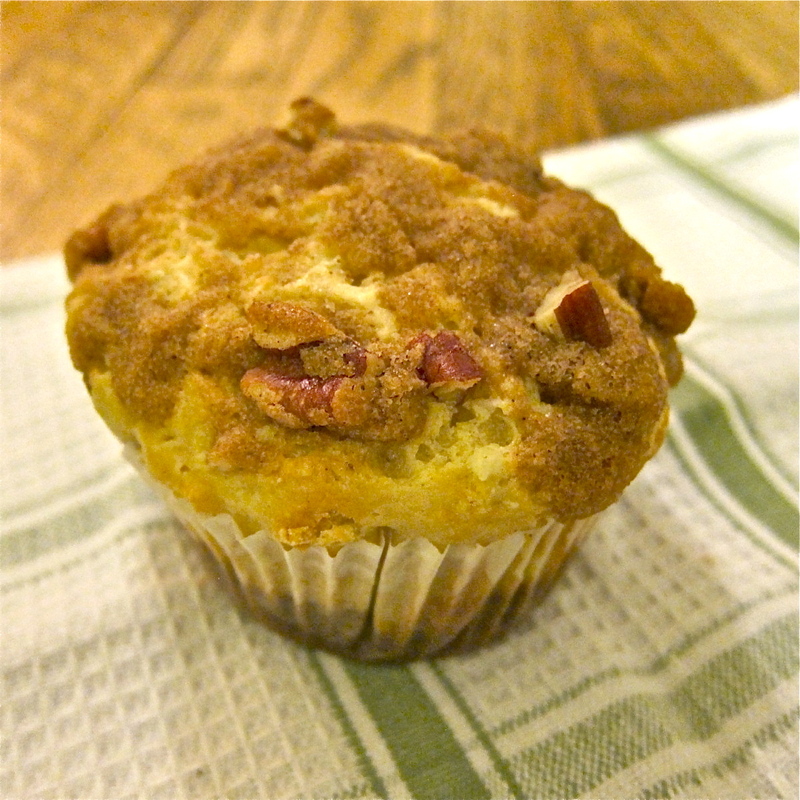 Vivid molasses notes resonate from the streusel topping, taking this muffin over the top. These marble streusel muffins are layered with a sweet confluence of flavors that will have you wanting more. – Add cocoa powder in the remaining mixture. streusel makes anything just that much beter! yum! toasted pecans would add a great nutty flavor! glad you could bake with us this week! I like your variation using pecans in the streusel, definitely a welcome addition to chocolate and cream cheese. The first thing I thought was, wow that muffin looks so light. Then I read on & the light looking muffin went very well with your almost lyrical “dance” analogy. I too layered my muffins instead. Good to see I wasn’t the only one! This looks so delish! Glad to bake along with you on this Muffin Mon.! Happy Halloween ! JENN & Christina – i too am a sucker streusel! Love the way you describe these, Nastassia! Perfectly and beautifully. I also loved the contrasting colours and flavours in these muffins, and great idea to layer the batters next time. Gorgeous take on the muffins; I bet they were fabulous with pecans! I’m all about cream cheese-laced muffins. Your prose is pure poetry 🙂 Now, gimme a muffin! I love the marble action going on here… and good to know about layering the batter. I got to whip up a batch of these – my man loves marble cakes. I think, though I haven’t tried it yet on these muffins, you can put the chocolate and vanilla layer side by side, then use a scewer to create a swirl!